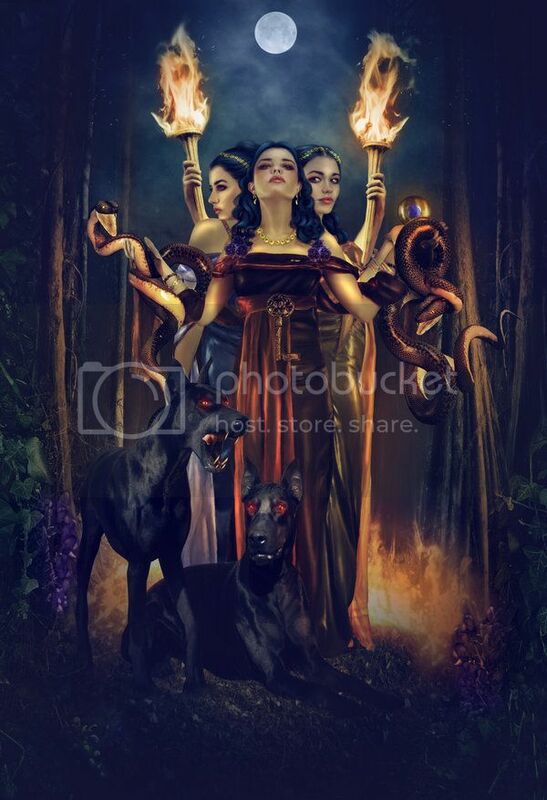 The Goddess Hecate is a triple Goddess in that she rules the Heavens, Earth and the Underworld. During the times of Hecate, there really was no such thing as a Crone. Dark Goddess yes. Crone, no. If you look at images of any Goddesses, they are never depicted as old. Dark Goddesses in ancient times did not mean old but merely an aspect of what they represented. The phrase "Mother, Maiden, and Crone (Triple Goddess) is a neo pagan concept and most particularly Wiccan. The first time this phrase was brought forth was through Robert Graves in his book White Goddess. He claimed there was a triad of Goddesses as such, but his theory has been discredited due to lack of primary sources and poor research. Maiden, Mother and Crone sounds very poetic but that is all that is was and is. For proof, one can merely look at ancient plaques and/or paintings on ancient walls or even statues which never depicted an elderly woman. However, to Neo pagans, as a triple Goddess, Hecate represents Maiden, Mother and Crone. The Goddess Hecate is Mistress of the Night and represents the waning to dark cycle of the Moon, and most particularly the three days of the dark moon. Hecate symbolizes the dark within us, the part of our psyche we refuse to acknowledge. Many ignore the wisdom, the strength and the truth of Hecate, because our fear of the darkness is so strong. Hecate is associated with the dark side of the moon, but this is the true Moon. The Moon has no light of its own, only reflected light from the sun. Dark is the Moon's true color as is Hecate's. Hecate can be called upon during the waning moon and more powerfully, during the three days when the moon is dark. In pronouncing her name, in the Greek language the "H" is silent. So, to properly pronounce her name is "E-CA-TA" or "e-CO-ta." To the Neo pagans, in Her maiden aspect, she stands for new beginnings. She can also be called upon when you need to look at something in a new, fresher way....a way that you have never looked at it before. You turn to Her when the moon begins to first wax. In Her Mother aspect is a time to turn to Her when you need nurturing and protection like any mother would give. Turn to Her when the Moon is Full. In Her Crone aspect, it is a time to turn to for protection, wisdom and magick. However, please bear in mind that Hecate is not a Goddess full of tenderness and compassion with white lace and linen. She is also more prone to be stern with you if you brought a situation upon yourself. However, Her wrath is swift and just to those who cause harm to a follower of Hers, because those who seek Her, honor Her and do not fear Her are in Her protection and She does not take lightly to those who cause them harm. She does not tolerate nor does She coddle. Turn to another Goddess if you seek this. Her actions are swift and without frills. So, when you do call upon Her, be prepared for Her swift actions and changes because it might not be what you expected. Hecate teaches us an important lesson, which is that the feminine should be valued for itself, not because it brings sexuality or power, but because deep within it there is an eternal wisdom. Hecate is also the High Priestess, the keeper of the Mysteries. Hecate is not the priestess who seeks the inner knowledge, but High Priestess who has found it and imparts it to others. Hecate, who sits enthroned before the Veil of the Temple as the High Priestess, the card in the Tarot which is ruled by the Moon. To reach daylight on the other side of the Veil, we must all become at one with the Dark Mother of the night. Whether it is Hecate guarding the home or of the temple, She will avert evil and provides protection. The Goddess Hecate is also known as the liberator of women, as she sets women free from the bonds created by man. That is why the Christian Church put Hecate down and created her as the Goddess of evil and destruction. During Medieval times, pagans were being tortured based on their belief in the Goddess. Patriarchy reigned and the fear of feminine power caused the Church to demonize Hecate. She was made infamous as the crone; old, wrinkled, ugly, warts protruding from her nose and chin, mysterious, dark and loathsome. Many mistakenly call Her the destroyer, but She is not for if you destroy something, that something is forever gone. You cannot bring something back that has been destroyed. It has been said that the Goddess's service is perfect freedom. She is the liberator because She is manifest in our deepest drives and emotions, which always and inevitably threaten the systems designed to contain them. She is love and anger, which refuse to fit comfortably into the social order. To be "free from slavery" once meant that, within the ritual circle, all were equal, whether they were peasant, serf, or noble in the outside world. Slavery today could be mental and emotional as well as physical: the slavery of fixed perceptions, of conditioned ideas, of blind beliefs, of fear. Witchcraft demands intellectual freedom and the courage to confront our own assumptions. It is not a belief system: it is a constantly self-renewed attitude of joy and wonder to the world. Hecate enforces feminine independence from masculine influences and this deals in all things including the religion known as Wicca. Wicca is heavily influenced by the male God. The Sabbats are centered on the male God. The word Wicca is a male term....a term connected to the Goddess religion. Hecate originally was a Thracian and pre-Olympian Goddess. Zeus bowed down to her antiquity by granting to Hecate alone a power shared by Zeus, that of withholding from humanity anything she wished. He also "granted" her the powers of the heavens, on Earth and the underworld......as if She did not have these powers already! He gave her nothing of that which She did not already have. Of all the Goddesses, she was the most markedly triple and the most complex. She was Goddess of the Wild Hunt. She was to Greeks and Romans, especially the Goddess of the crossroads. Statutes of Her stood there, and food offerings –"Hecate’s Supper" – were taken there at dead of night, on the eve of the full Moon not because She represented the Full Moon but because of the mystery and magick of the Full Moon itself. Her annual festival on August 13 was a propitiatory one, to avert the harvest-destroying storms which the Moon is apt to send at around that time. She also haunted graveyards and the scenes of crimes–as a goddess of expiration and purification. 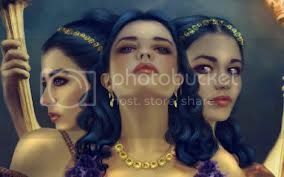 Hecate is the Darksome Mother, in both the positive and in the negative sense. To those that dare to welcome Her, she brings creative inspiration. She is Hecate Antea, the Sender of Nocturnal Vision, and, typically of a Moon Goddess. She is Hecate Trivia, Goddess of the Crossroads. One of her symbols is the torch, for the Dark Mother also holds the light which illuminates the Unconscious and reveals its treasures. With Her torches she guides those who are seeking the mysteries. The light from these torches will lead those wishing to understand the mysteries. Many Goddesses carry torches but the Goddess Hecate is the only Goddess who carries two. In the Tarot, She is the Threes and the High Priestess; Her gems are star sapphire, pearl, moonstone, and crystal; Plants are the yew tree, cypress, opium, poppy, almond, mugwort, hazel, moonwort, civet, menstrual blood, camphor, garlic, aloes, all sweet virginal odors; Tools are the cauldron, the besom, knives, the key; animals are the dogs and horses, black cats. In ancient times, when one saw a black dog at a cemetery, it was said that that was Hecate. The owl is Her messenger. Her chariot is pulled by dragons. Hecate’s colors are silver and black. Some like to have the color purple as one of Hecate's color, which is easy to understand. In the world of artists, purple is used to create shadows and darker tones. In some of your black birds such as Ravens, Crows and crackles, one can see the sheen of purple in their feathers. Hecate taught the Witch Medea the secrets of magick and empowered Medea in order for Medea to draw down the Moon, which Medea often did. See Drawing down the Moon. The Moon Goddess Selene, who is the actual Full Moon, is angry with Medea for pulling Her (Selene) from the nightly sky and to draw the moon into Medea. Selene wanted to remain in the sky so that she could ever watch over Her sleeping lover. Medea needed Hecate's empowerment to draw down the Moon. 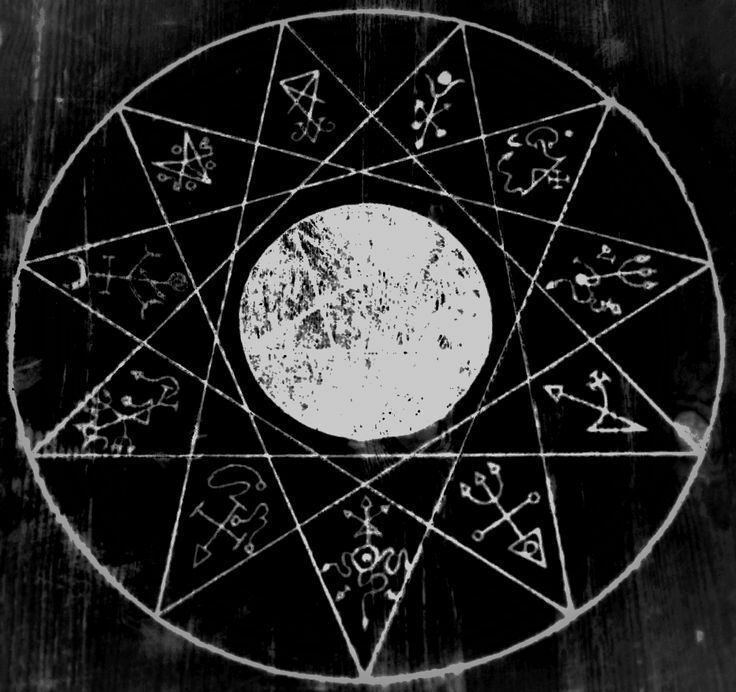 So, as much as Wicca would like one to believe, as long as you are empowered by the Goddess Hecate, you need no one else to draw down the moon into you. You need no male to perform such a magickal experience. As mentioned early, the Goddess Hecate sets women free from the trappings of men and that includes the masculine religion known as Wicca wherein it states that only a High Priest can draw the moon down into the High Priestess. Through Hecate’s Cauldron, we must look at our true self, the nature of our motives and the results of our actions, because only through Her cauldron can we truly be reborn in becoming a better person than we were before. Only when we look into Her dark cauldron can we see the light. Hecate, and none but She, is Queen of all living things. It is through Her that all things live or die. She smiles as the energies of the dark moon is everywhere for there is no power like Her power and no living thing can withstand Her power. For She is anticipation. She is the fulfillment. She is death. Hear her words, children, worship and be glad, for if you seek Her, She is with you always. She was with you in the beginning and shall be with you at the end. Days of Hecate are August 13 which She is honored and prayed to in order to not send fearce thunderstorms and ruin and the crops. November 16 is the Night of Hecate which begins at sunset. This is the night of Hecate's supper and animals were sacrificed in honor of Her. November 30 is Hecate-Trivia--the day of the Crossroads. The 29th of each month is the Moon of Hecate. I have come across several websites which states days such as May 8, a date in June and December 31 and even January 31 are festivals of Hecate. Through all of my research on Hecate, I have never seen any historical proof on those dates I mentioned. The date of December 31-January 1 there was a festival but it was in honor of the God Janus who has two faces which can see the past and into the future. There is nothing wrong in performing a ritual on behalf of Hecate on December 31 to release the old and bring in the new. For the date of January 31, a website stated that this is the date when Hecate hands over her torch to Brigit, indicating the ending of winter and the beginning of spring? In the changing of the seasons, the myth of Demeter, Persephone and Hecate explains the seasonal changes plus the fact that Hecate is Greek and Brigit is Celtic. What you are getting is a chance to own your very own white magickally imbued spirit of the Goddess Hecate power pendant! This pendant is incredibly beautiful, giving off the glittering colors of both light and dark, and representing all that is embodied by the Triple Goddess of the moon. Imbued pendants are quite a bit different then spirit bound vessels, in that they act as a portal to another dimension, allowing the imbued to hear you directly, and allowing her to immediately come to your aid. Once you have received the pendant, all you will need to do is petition her when you are in need. You can use any prayer to Hecate, even making your own. However, here is one that we use, which we also found on the internet some time ago, and has been working perfectly to get her attention! Holds you in her arms. Who has taken Her throne. Once you have held the pendant in your right hand, placed your left over the top of the pendant, and said the words above - or some rendition thereof, you are free to talk with her. Go ahead and voice your needs to her. Remember, she is here to help you, but do not bother her with petty things, as she will surely let you know if she thinks your concern is simply trivial. She is incredibly busy, but will help you when you truly need her! Remember, this is 100% REAL MAGICK. It is not a game. It should not be used in any way, other than out of total respect to the Goddess. Petition her when you are at a crossroads, with a decision to make that you need divine guidance in answering. Petition her for feminine strength, divine knowledge, and power of your situation. Take charge of your life again. She is fierce and strong, and can teach all women lessons about themselves. She will help you identify with both the light and dark in yourself, and make good decisions for your future. She can help you triple your mental clarity, psychic visions, clairvoyance, astral projection power, and tune you to the vibrations of the moon and earth. She is an incredible giver, as long as you are grateful and thankful for her. Forget to thank her, and she won't be as quick to grant you a wish again though, so be careful when asking for things without gratitude for what she has already given. She is incredibly powerful, and there is nothing that she cannot bestow upon you if she so chooses to do so. The possibilities are endless.